I always enjoy reading books that analyze emotions; that are a great read even without a really action-packed plot. Crash, by Jerry Spinelli, is one of these books. 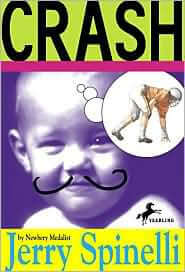 The author, already proven as a masterful children’s writer, gives us an entertaining tale of John “Crash” Coogan. We follow Crash throughout his childhood, starting from when he meets Penn–his next door neighbor. One of the refreshing things in Jerry Spinelli’s book is how real they are. These are subjects that kids (and adults) can relate to. As a sixteen-year-old, I enjoyed reading this book about a seventh grader. My aunt, a schoolteacher, still reads this book. Spinelli just has some air about him that makes his books real. It’s a great quality to have. The storyline is fairly simple. Crash, along with his best friend, make fun of Penn Webb constantly. They don’t really know why, except that he’s just so different. But throughout the book, Crash analyzes who his friends really are, and as he sees people like his sister changing, he changes as well. By the end of the book–well, I won’t ruin the story for you; you’ll have to read the book. The subplots aren’t very obvious in this book, but that’s one of the things tht make this book enjoyable–there’s two types of books: one uses intricate subplots to get you interested, and one focuses on one main story. Crash would fall in the latter category. While there are a few subplots (notable examples are Crash’s grandfather and his sister), for the most part the book focuses on one main storyline: the relationship between Penn and Crash. Taken with Spinelli’s incredible realism, this makes for a story that you feel actually happened. I enjoyed reading Crash–it was a refreshing break from some of the other reading I’ve been doing. The Spinelli realism and a nice story about a middle-school kid make this a good book. I recommend that you check this one out if you have the time–it would be worth it. Are there any new book reviews? ?